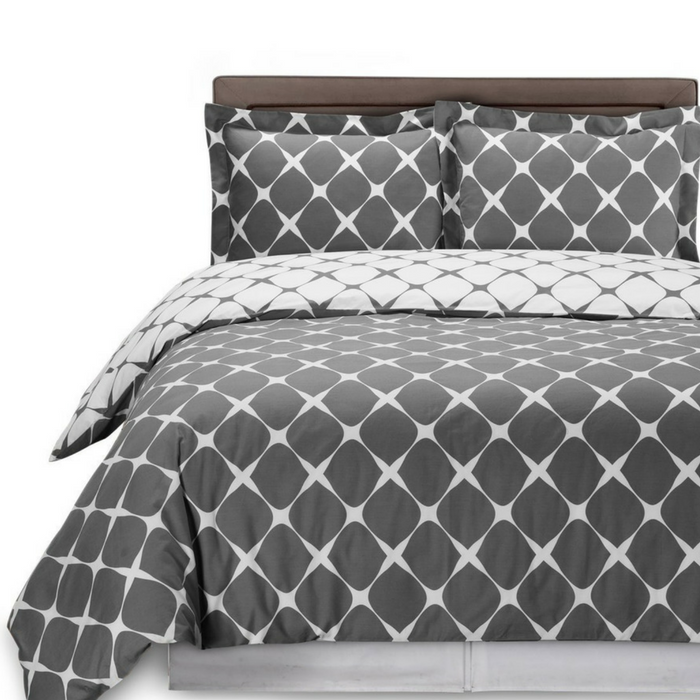 Queen Size Reversible Duvet Cover 3-Piece Set Just $13.99! Down From $45! You are here: Home / Great Deals / Amazon Deals / Queen Size Reversible Duvet Cover 3-Piece Set Just $13.99! Down From $45! Hurry over to Amazon to score this Queen Size Reversible Duvet Cover 3-Piece Set for just $13.99 down from $44.99 PLUS FREE shipping with Amazon Prime or for orders over $25! Take home this beautiful duvet cover set to boost the décor in your room. Its contemporary assortment features a modernized diamond-like patterns of a fashionable look, and made with geometric link pattern that reverses to a brilliant negative solid color. When you get equipped for an alteration, this duvet cover allows you to reverse it, and the other side features a negative print of the same pattern, so you can promptly modify the presence of your bedroom. Lovely soft geometric patterns cover the duvet set to revivify your bedroom scheme. Includes Extremely Durable Reversible duvet cover measuring 90 by 90 inch which front print opposite from back print; 2 soft pillowcases or shams measuring 20 by 26 inch with 2 inch flange. Diamond shapes are featured on a modern take on the modern set. Hotel Quality 100% brushed Velvety Microfiber, the fabric is exceptionally comfy and iron easy . Material is processed to protect against any shrinkage after washing; fade and stain resistant. Machine washable at warm water; tumble dry low and do not bleach. Add a fresh makeover to your bedroom decor with Moodowell comfortable duvet cover set. Available in queen/king size, grey/blue/black/beige color. This set is easy to clean and maintain in your standard washing machine, allowing you to enjoy for many nights ahead.